Newport had drawn 2-2 away at Accrington earlier in the season. Accrington Stanley kept pace with their League Two promotion rivals as two goals in two first-half minutes secured victory at Newport County. Billy Kee opened the scoring with a close range finish after Joe Day could only parry Matty Pearson's shot. Josh Windass doubled the lead two minutes later when he converted Piero Mingoia's cross from the right. Stanley move up to fourth but remain one point outside the automatic promotion spots. Newport's third successive defeat sees them drop to 18th in the table, but they remain 13 points clear of the relegation zone. Newport County manager Warren Feeney told BBC Radio Wales: "They are an honest bunch but today they let me down. I thought it was a below par performance after the goals. "My son's eight and he would probably run around the pitch more enthusiastically than some of them. "The aim was to stay up and get over the line and we're getting closer. The quicker we do it, the better." Match ends, Newport County 0, Accrington Stanley 2. 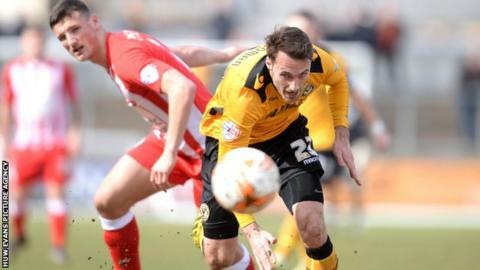 Second Half ends, Newport County 0, Accrington Stanley 2. Corner, Accrington Stanley. Conceded by Tom Meechan. Attempt saved. Billy Kee (Accrington Stanley) right footed shot from the centre of the box is saved in the bottom right corner. Attempt missed. Jake Gosling (Newport County) right footed shot from outside the box is just a bit too high from a direct free kick. Foul by Romuald Boco (Accrington Stanley). Attempt missed. Romuald Boco (Accrington Stanley) left footed shot from outside the box is just a bit too high. Attempt missed. Piero Mingoia (Accrington Stanley) left footed shot from the right side of the box is close, but misses the top right corner. Substitution, Newport County. Tom Meechan replaces Ben Davies. Substitution, Accrington Stanley. Romuald Boco replaces Josh Windass. Attempt missed. Josh Windass (Accrington Stanley) right footed shot from outside the box is too high from a direct free kick. Corner, Newport County. Conceded by Matty Pearson. Attempt missed. Josh Windass (Accrington Stanley) right footed shot from the right side of the box is close, but misses to the left. Substitution, Newport County. Matt Partridge replaces Yan Klukowski. Attempt missed. Scott Brown (Accrington Stanley) left footed shot from outside the box is just a bit too high. Scott Barrow (Newport County) wins a free kick on the right wing. Attempt blocked. Jake Gosling (Newport County) right footed shot from the left side of the box is blocked. Corner, Newport County. Conceded by Tom Davies. Attempt saved. Billy Kee (Accrington Stanley) right footed shot from the centre of the box is saved in the top centre of the goal.